THE B-MOVIE NEWS VAULT: Vestron's Collector's Series releasing C.H.U.D. 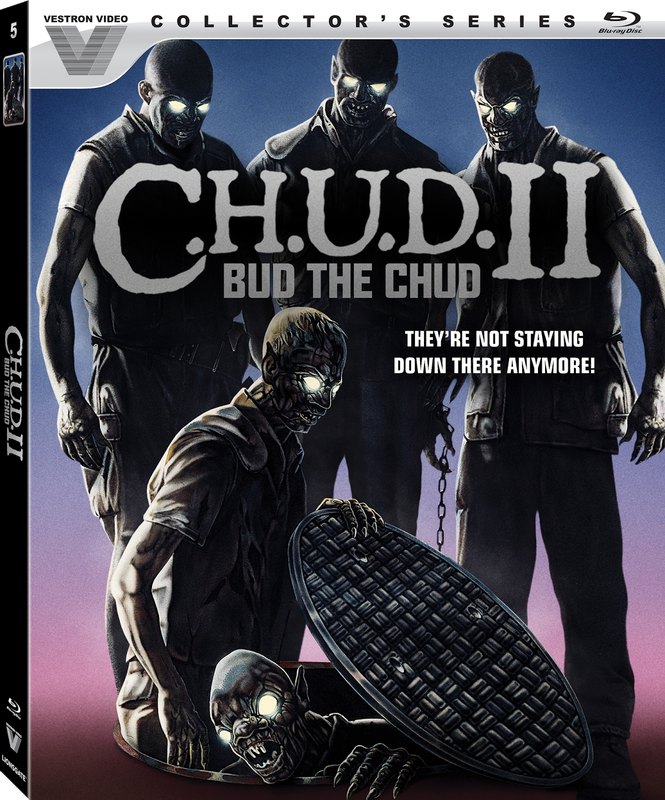 II: BUD THE CHUD to Blu-ray on 11/22! Vestron's Collector's Series releasing C.H.U.D. 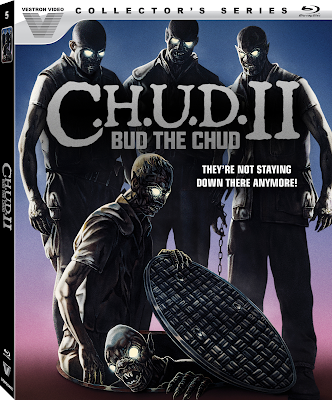 II: BUD THE CHUD to Blu-ray on 11/22! THIS C.H.U.D. 'S FOR YOU! THE INFAMOUS SEQUEL IN NAME ONLY COMES TO BLU-RAY, COURTESY OF LIONSGATE'S VESTRON COLLECTOR'S SERIES LABEL! I haven't seen C.H.U.D. II in so long, but recall it being more like a failed RETURN OF THE LIVING DEAD sequel than a C.H.U.D. followup. Still, it's a pretty fun little flick that unexpectedly got the royal treatment from Lionsgate. Synopsis: Kevin, Steve, and Katie are an inseparable trio of friends doing some extracurricular snooping inthe school science lab when, among the test tubes and beakers, they discover a corpse! But before they can say 'Abra Cadaver,' the body disappears, rolling down Route 51 strapped to a gurney. Audio Commentary with Director David Irving. Interview with Actor Gerrit Graham. Interview with Actress Tricia Leigh Fisher. Interview with Special Effects Artist Allan Apone. C.H.U.D. II: BUD THE CHUD is available wherever discs are sold on Tuesday, November 22nd! Currently it would seem that Diabolik DVD has the best price for it ($23.99) but you can also pick this disc up at Amazon.com or Bullmoose.com! So be sure to order this release right now Vault Dwellers, and while you wait for it to arrive, you can listen to the "Bud the Chud theme song" on a constant loop! New DVDs & Blu-rays for 11/29/2016! New DVDs & Blu-rays for 11/22/2016! New DVDs & Blu-rays for 11/15/2016! New DVDs & Blu-rays for 11/08/2016! New DVDs & Blu-rays for 11/01/2016!